Home yoga practice | do yoga! This is a fabulous all round posture – it’s a balance which improves concentration and co-ordination, back bend which improves posture and breathing and when done dynamically with the breath is energising, warming, clearing the respiratory system and improving circulation. Start with 5 each side increasing to 10 gradually. Find a space where you can practice – warm, clean and free from furniture/low ceilings. First take your arms out to the sides and up overhead 3 times slowly. Then place your hands onto your hips and alternate taking the legs back without leaning the body forward 3 or 4 times on each side slowly. This warms up the muscles and IMPORTANTLY ensures that you have enough space around you to work. Place your weight into your right foot. Return to Tadasna as you exhale. Repeat x 5, rest for 5 breaths then do 5 on the Left side. As with all our practice – do not strain, if something doesn’t feel right for your body (my shoulder hurts or my knee doesn’t like that) then miss out that part and do the other exercises. Some work for you body is much better than none. Remove your socks and shoes if possible. Allow the feet to spread out on the floor or your mat, positioning them directly under your hip joints. Bring awareness into the soles of the feet and feel your weight sinking down evenly through the whole surface of the sole. If you feel unbalanced, bring awareness to each side of your foot in turn – leaning forwards, backwards and side to side. Come to stillness – an evenness of weight now descending through the soles of your feet. Next interlace the fingers in front of you and as you inhale take the arms over head and rise up onto the balls of your feet. As you exhale return the heals and arms down. Repeat 5 times. Pause. Now take the feet a little wider so that they are on the outsides of your hips. This time keeping the heals in touch with the floor, breath in and take the arms up the front, as you exhale take the arms over to the right side keep the hips still and let the movement come from the waist. Keep facing forward, do not strain. When you need to breathe in come upright to the centre and then exhale down to the left side. Feel as though you are light and loose, don’t push. Lift the hands up each time you breathe in to the centre. Repeat 5 times to each side. Pause. Smile. This is a free moving twist for the upper body. 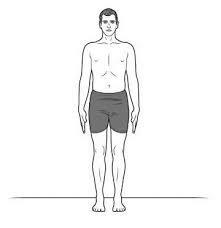 Keep the feet in the wide stance and soften the knees, breathing in raise the arms sideways to shoulder height. 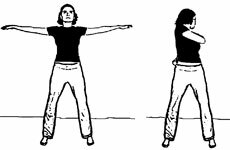 As you breathe out twist around to the right allowing the arms to wrap around the back of the waist and the shoulder as in the picture. Swing around 5 – 10 times to each side, feeling the freedom of your spine. Come to stillness, move the feet back under the hips. Pause for a few breaths in Tadasana. We all overindulge from time to time – at Christmas especially we tend to get into the ‘swing’ of things and let our hair down. Also, at this time we can be enticed to try something other than our usual tipple – but then it’s more difficult to notice the effects until it’s too late. While the best way ever to relieve a hangover is to not get one in the first place – if you halo does slip then yoga practices can come to the rescue. Take it slowly and be fairly deliberate with each pose – even if it is a rest – as that’s what your body needs. Settle yourself (use a blanket under the shins and/or blocks under your bottom to enable you to sit here comfortably). Watch the breath for 10 x in and out. Recite your favourite mantra, ‘OM’ or “I try to find the right balance in all things” (a mantra for moderation – better late than never!) 10 times. Work very gently to mobilise the spine. Follow the breath sinking the tummy down into the inhale and then as you exhale lift the tummy and lower the head. All movement should be slow and deliberate. This exercise will help to ‘breathe’ the body increasing the exhale process and getting rid of toxins and relaxing the muscles of the neck and back. Practice up to 10 times. If this exercise doesn’t feel right for your tummy or head tough, skip this and the down dog and go to straight to the Staff pose. Headstand and handstand are the classic cure for headaches. However, if you have never done one before now is not the time to experiment. To do either of those postures takes many years to build up the correct strength in the whole body – and actually, you can get most of the benefits by doing the Down Dog. The way these postures help is to increase the blood flow to the head and neck areas (blood that has increased oxygen from the exercise before). So if, after the Marjariasana you are feeling OK, from a neutral position (hands and knees with the back neither up or down), take a breath in and on the out breath push your bottom back and up to make a triangle position. Keep your head sandwiched between your upper arms. Breath smoothly and slowly about 5 times and then lower down to hands and knees and then to kneeling. Settle the body once more. 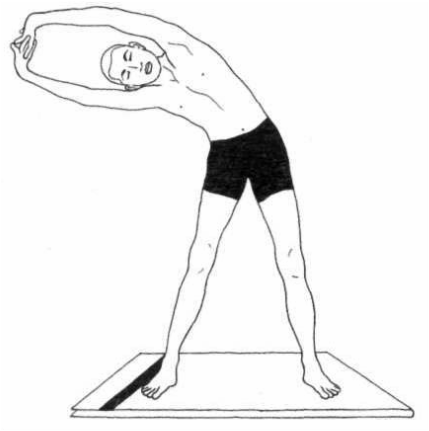 Take 10 smooth breaths in staff pose, ensure the shoulders are over the hips, shoulders are relaxed and crown of the head facing up towards the ceiling. Twists have the effect of ‘wringing’ out the fluids in your abdominal area and are a great way to get toxins moving out. From the Staff pose, cross one foot over the other leg. Hug the knee into the chest with the opposite arm and breathe in deeply. As you exhale twist the body around and place the free hand on the floor behind you. You can turn your head around too depending if this feels comfortable for you head and neck. Stay in the pose for around 5 deliberate breaths and then unwind on the inhale. Sit in the Staff pose for 5 breaths before taking the twist on the other side. 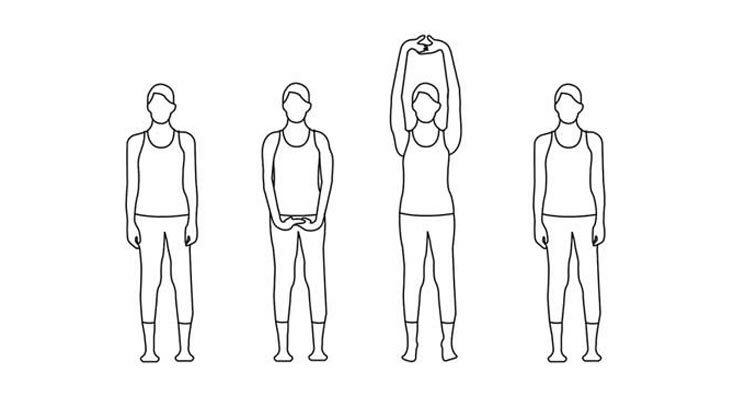 Complete the sequence with 10 breaths in the Staff pose. When you practice yoga regularly you become closely tuned in to your body and are more able to read the signs of when enough is enough. Your tolerance to alcohol may actually lower due to the purification aspects of the practices. Yoga affects us in many different ways – some you appreciate and come to expect straight away but others you just don’t see coming and can be amazing. Do let me know if this sequence works for you. Have you been burning the candle at both ends? Got a cold and can’t sleep because of a stuffed up nose? Been putting in long hours at work due to customer demands or co-workers off sick? Left untreated, tired eyes can lead to eye strain, headaches and a build-up of tension throughout your whole body. 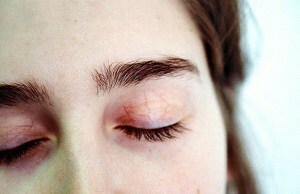 If you are going through a stressful life issue, tired eyes can hinder your thinking, making you feel lifeless and dull. As they say, your eyes are the window to your soul so it’s wise to take heed and do something about it. Getting enough rest is crucial – try getting a couple of early nights – whatever it takes (cancel a party, use 2 or 3 propped up pillows). Simply ‘resting’ your eyes even if you can’t sleep still helps. There are several yogic exercises that help to relax your eyes and bring more oxygen to them. Practice one or 2 of the following exercises 2 – 5 times during your day for both instant and long term relief. Quick note – when you practice these exercises, keep your back straight and head still, relax your shoulders, breathe steadily and just move your eyes. Open your eyes wide, look from side to side 10 times, then up and down and then diagonally 10 times. Imagine you are staring at the face of a clock. Starting at 12 o’clock, slowly move your eyes from minute to minute along the clock until you return to 12 o’clock. Rest your eyes then repeat going in anti-clockwise direction. Look straight ahead, hold your thumb up about 30 cm in front of your face and focus at your thumb nail, then focus on something in the distance. Relax and repeat 5 – 10 times. Change hands and look at the other thumb. Close your eyes and press the tips of your fingers to the outer edges of your eyes. Gently massage this area using small circular motions. Relax and repeat 3 – 5 times. Close your eyes. Rub your palms vigorously together to warm them up and get the energy circulating quicker. Cup your hands over your closed eyes for 30 – 90 seconds. Stay focused on your breath and gradually release your hands. So next time your eyes feel tired and you know you have being over doing it, take a rest and give these eye exercises a go. 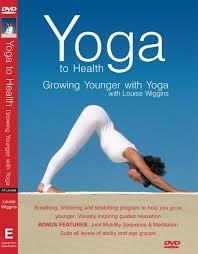 This book by Louise Wiggins is a very accessible book for anyone to pick up and use – in fact it would make a great gift for someone who was thinking about yoga but wasn’t convinced that the practice was for them. 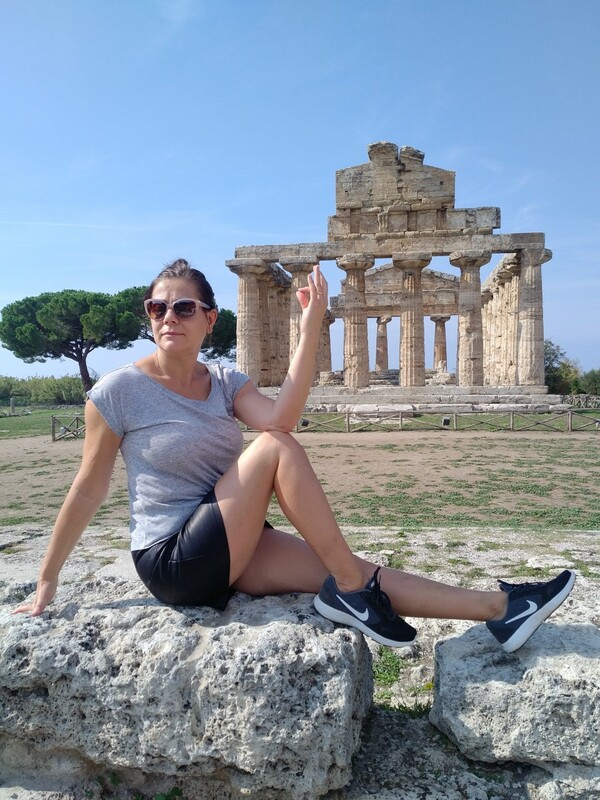 Besides many pages of postures and routines for arthritis, relaxation and bouncing back from illness, Louise includes plenty of testimonials from people 70- 80+ about how yoga really has given them a new lease of life. There are very compelling reasons for practicing a daily routine of yoga plus recipes and tips on healthy diet too. “Biologists agree that our biological age potential is about 130! That means when we reach the age of 65, we are really only middle aged! I thoroughly recommend it for you and for you to give as a gift to someone you love.